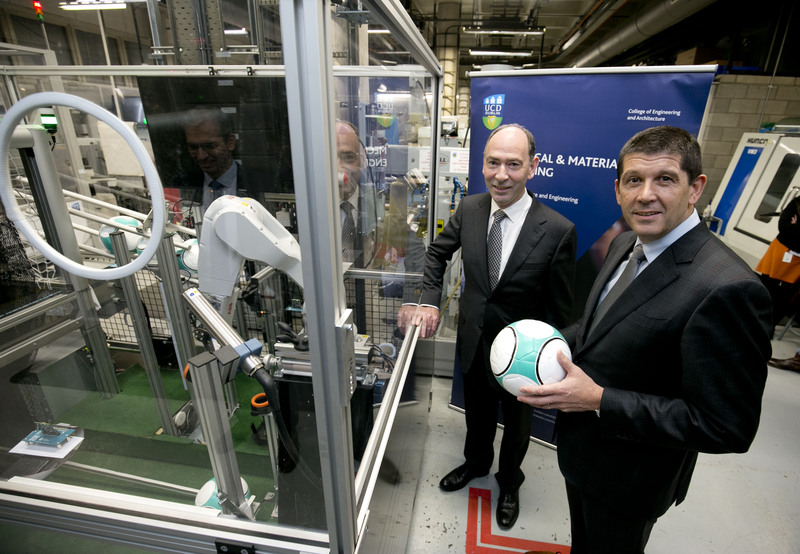 MUNICH, Germany, and DUBLIN, Ireland – Dec. 12, 2018 – Engineering students at University College Dublin (UCD) will have the opportunity to gain hands-on experience with Industry 4.0 principles using an automated football factory demo donated to the University by Maxim Integrated Products, Inc. (NASDAQ: MXIM). The demo integrates several of the company’s adaptive manufacturing technologies, including the recently announced Go-IO industrial internet of things (IIoT) reference design. 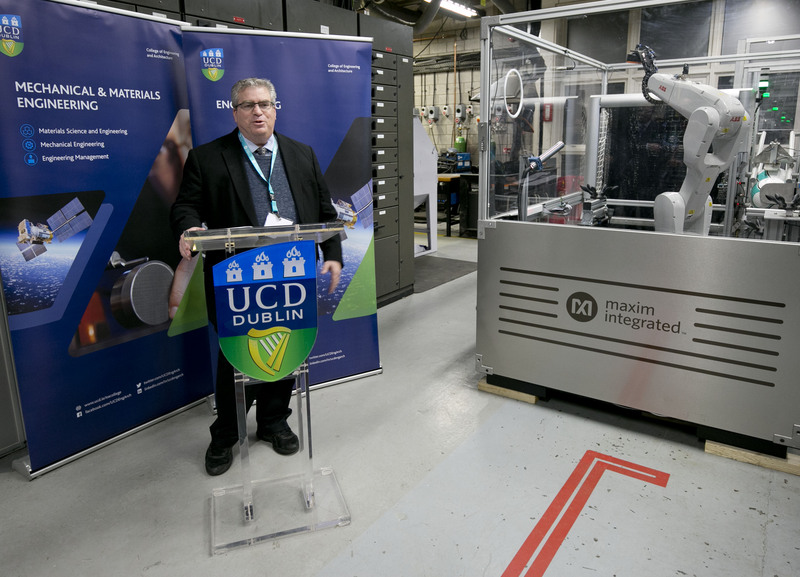 In a world of rapidly evolving production technologies, the donation to the UCD School of Mechanical and Materials Engineering will help current students and future engineers learn the principles of a smart factory and how to design fully automated and intelligent production equipment with self-diagnostic and adaptive capabilities. The football factory commences with regulation-size footballs and tests them for weight, air-pressure, bounce height and roundness. The footballs are handled by an industrial robot, and the entire assembly line is controlled wirelessly by an iPad® app. The demo also showcases the principles of adaptive/flexible manufacturing, where the production system embodies a level of flexibility to react to different environmental conditions, product variations, specification changes or even product options. Not only is this demo optimised to test size five footballs; it can also be configured on-the-fly to test different-sized footballs, such as size four and size three. When such smaller footballs are inserted at random in the production line, the demo factory identifies the product variation and re-adjusts the different sensor calibrations as well as the robotic software to process the appropriate-sized balls. The Go-IO IIoT reference design is the backbone for this digital football factory. It consists of Maxim’s new third-generation industrial automation chipset made up of 12 highly integrated ICs, 17 IOs supporting multiple digital IO configurations, a 4-channel IO-Link master to provide a universal IO interface to both analog and digital sensors and a robust 25Mbps isolated RS-485 communications channel that provides a reliable, multi-drop data network for uploading time-sensitive health and status information into the cloud. The football factory demo epitomises an Industry 4.0 factory that is locally controlled by a programmable logic controller (PLC) reference design driving a host of intelligent sensors that communicate the factory’s health and status information to enable real-time decision-making to optimise productivity. The advantage of having a small, distributed PLC working in conjunction with smart, IO-Link-enabled sensors is that changes in the assembly line can be affected at a local level and in real time. Go-IO pushes intelligence closer to the edge, enabling active monitoring and communication of equipment health and status information as well as higher throughput and productivity. The reference design also meets increasingly stringent size and power requirements of PLCs, providing a 10x smaller solution (one-half the size of a credit card) with 50 percent less power consumption compared to its industry-leading predecessor, the Pocket IO. The flexible, rugged, open-source Go-IO reference design is ideal for industrial automation, building automation and industrial robotics applications.